Gig Harbor got a substantial amount of snow over the weekend of Feb 9-11. Have the pictures showing 11″ of snow that stuck around for almost 10 days. Snow drifts from the even were still visible in till about March 15th. The snow did a number on our the trees and plants in our yard. Leland Cypress by raise vegetable hillside, inside the dog wire. This was a smaller 7″ diameter tree about 20′ tall. Was part of shielding the yard from the neighbors. 3″ dia. 14′ small Spruce by studio walkway, also damaged a few branches of the Leland Cypress beside it. 10″ dia. 45′ Douglas Fir just north of the property line by walk to septic leaning against other trees in the area. 6″ dia. 20′ Cherry tree by fire pit tilted over to into the scrub brush. Tall, not very healthy looking maple to the west of the well, lost a large branch, which is still partially attached. It is amazing to think a year has gone by. Moved in November 9th 2017. Here is a break down of what we accomplished in 2018. Sump pump for crawl space, New vapor barrier. – Crawl Space solution. 1 x Swan for Fire pit. Added Led shop light and power drop -main room studio. 3 x 1/2 Wine Barrel in raised bed area. Cleared out around stumpery and center section. Not including the routine maintenance of the property. Must have run the mulched for over 50 hours and close to 60 yards of mulch. Looking forward to what we achieve in 2019. Drone Project. Started a new project trying to map the property using drones and images coupled with ERSI ArcGIS Pro to turn the drone images into a hi resolution map that can be turned into a 3D point cloud. This used with the ground based mapping robot “Max” then we can get the fine details into the map and then put in the variations into the map as the seasons and plants change. Will also record our yard art and map new garden projects. will Be interested to learn how these tools can be used for all the features and objects we have on the property. Then the DJI spark drone is my next learning experience. Wonder how well I will do with it. If I can fly it for a few flights. before I crash it. Has a lot of cool features but using the Samsung is a bit of a pain. So need to learn how to keep the Samsung connected. Also the DJI go 4 app is a bit buggy and has been a trick to get everything hooked up. Powering up the drone is also a trick it is a two press of the button Press then press and hold. to turn on and off both the drone and the remote control. Can wait to chase the deer and rabbits off the property with it. Wonder if it is possible to scare them away with the drone. Planning on getting my 107 certification and a. drone from DJI part of the developers group. Will also use this to help with the 360 cameras and 3D mapping. So this is a start of a interesting transition from ground based robots to drones. Started the group of Infoblox HPEL’s to start doing robot stuff again and solving some of the problems with perception and mapping. Over the course of the last 3 months we have had gardeners come every other Friday for $100 a visit and trim the lawn and cut the over growth out of the center section. They have pretty much opened up the center area for the next phase of what we could possible do. It is a lot of area. So much potential. Wonder what we will do with it !. 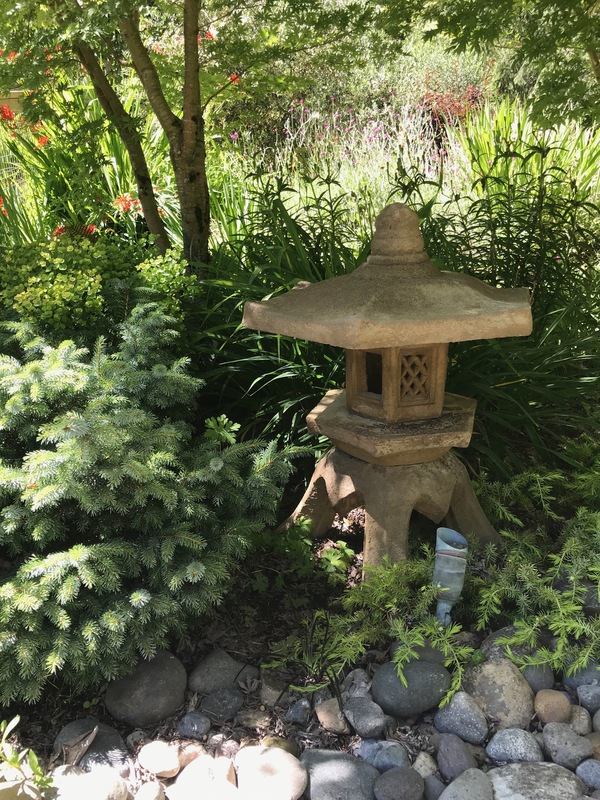 On July 8th 2018 Mardi and I purchases two pagodas from Rosedale’s Nursery $302. they are a yellows cast one tall and thin “Laurel” one short and wide “Hardy”. 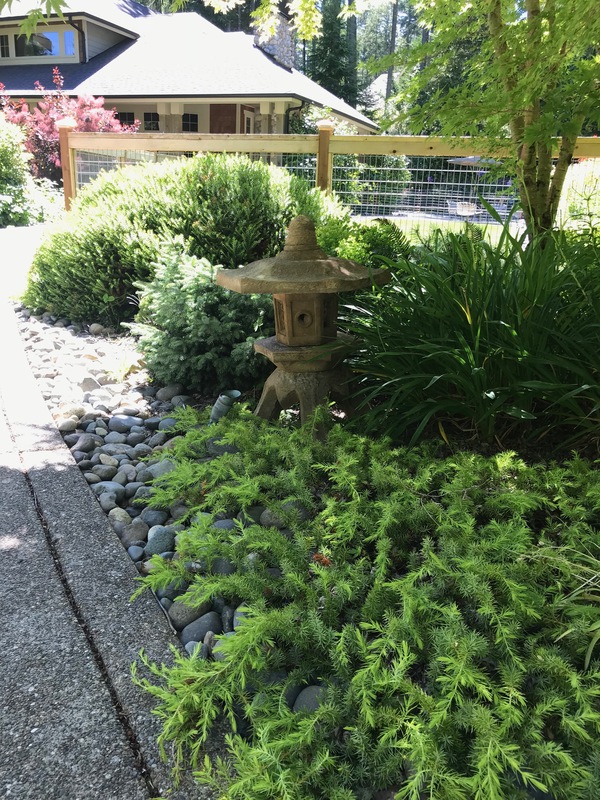 The taller one is to the left of the walk way as you enter towards the front door, behind the bird bath. The wider one is on the path to the studio. These make great additions and look like they always belonged in those locations. The yard art is very satisfying in that it does not change with the seasons. Or requires trimming or watering. So makes for easy care garden details. July 7th spent about 5 hours weed whacking around the property. First finished off the roadway all along the complete length of our property lines. I do not think this has ever been done in some sections. Also cleared out the grow around the utility boxes to the south of the driveway. This has been several years of accumulated growth. This was a big job about 8 hours of combined work to whack, trim, haul. During the process lost the cap to the filament spool had to replace it for a complete new assembly for around $32. but also got a spare spool in the process. Had started doing the north part of the property from the driveway but got carried away removing some overgrowth. Was a 4 tarp pile to move. Then cleared out behind the orchard. All the wild daisies had grown past their prime. This was about an hour of work. Trimmed back some of the plants to make it a bit easier to get back into the area. Finally went and whacked the leech field, it had vines piling up on top of the ferns and weeds was about 30″ piles in some places. was easy to cut down the area took about an hour and half. Had to go back up and remote the roots of some pretty impressive black berry stalks / canes. Things I learned about the weed whacker. When you hit something with thrones it can pull the filament tight in the spool and jam up the feed. Having a full length of filament out really cuts down the weeds but makes the back spray a bit of a problem. It uses a lot of 50:1 will only run about 20 minutes on a tank of gas. 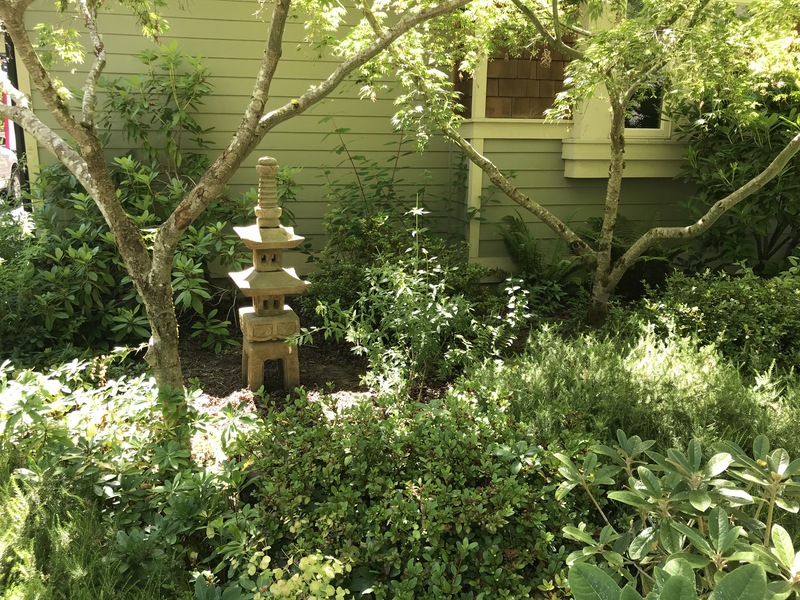 This weekend was the Gig Harbor Garden Tour. We scoped it out with Mardi’s visiting friend Karen Horton.We saw 6 home on Saturday and the Final house in Horsehead on Sunday. We even started talking about being a house on the tour in 2020. Who knows. We got a lot of ideas and even purchased a bird house from Jack. If we do the tour will need to get some June color and use lots of Miracle Grow. We need to add some yard details, Trellis, Frames, Balls, Fountains? We could really use a water feature. Time will tell.